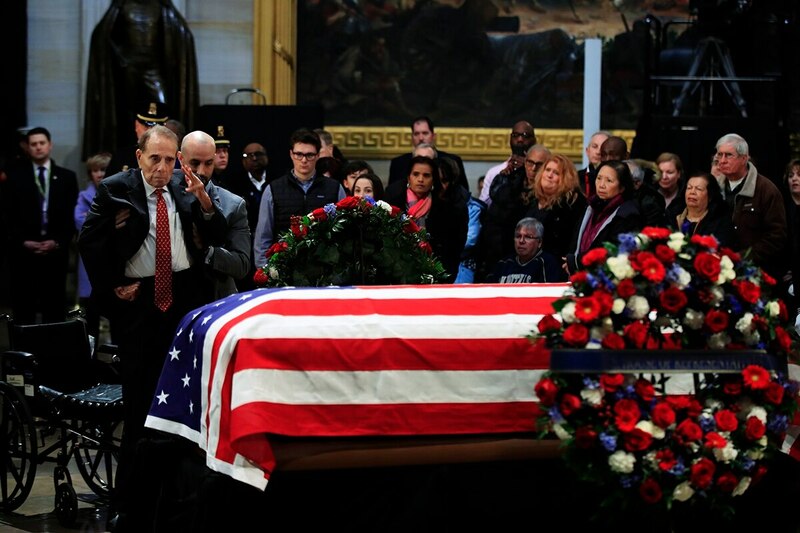 WASHINGTON — Soldiers, citizens in wheelchairs and long lines of others on foot wound through the hushed Capitol Rotunda on Tuesday to view George H.W. Bush’s casket and remember a president whose legacy included World War II military service and a landmark law affirming the rights of the disabled. Bob Dole, a compatriot in war, peace and political struggle, steadied himself out of his wheelchair and saluted his old friend and one-time rival. "I'm just here to pay my respects," said Jane Hernandez, a retired physician in the heavily Democratic city and suburbs. "I wasn't the biggest fan of his presidency, but all in all he was a good sincere guy doing a really hard job as best he could." Bush’s service dog, Sully, was brought to the viewing, too — his main service these last months since Barbara Bush’s death in April being to rest his head on her husband’s lap. Service dogs are trained to do that. The CIA also honored Bush, the only spy chief to become president, as three agency directors past and present joined the public in the viewing. In the midst of the period of mourning, first lady Melania Trump gave Laura Bush, one of her predecessors, a tour of holiday decorations at the White House, a "sweet visit during this somber week," as Mrs. Bush's Instagram account put it. And the Trumps visited members of the Bush family at the Blair House presidential guesthouse, where they are staying. 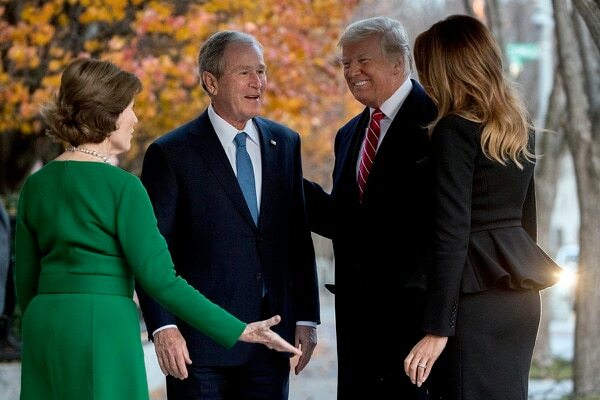 Former President George W. Bush and his wife greeted the Trumps outside before everyone went in for the private, 20-minute visit. Although President Donald Trump will attend Bush's national funeral service Wednesday, he is not among the eulogists announced by the Bush family, a list that includes George W. Bush. The others are Alan Simpson, the former senator and acerbic wit from Wyoming; Brian Mulroney, the former Canadian prime minister who also gave a eulogy for Ronald Reagan; and presidential historian Jon Meacham. People lined up before dawn to pay respects to the 41st president, a son and father of privilege now celebrated by everyday citizens for his common courtesies and depth of experience. "He was so qualified, and I think he was just a decent man," said Sharon Terry, touring Washington with friends from an Indianapolis garden club. Said her friend Sue Miller, also in line for the viewing: "I actually think I underestimated him when he was in office. My opinion of him went up seeing how he conducted himself as a statesman afterward." 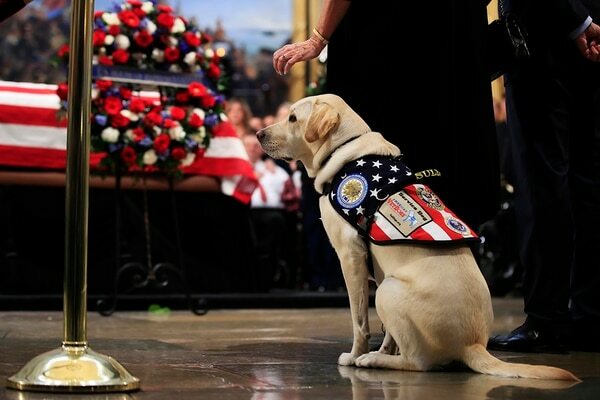 Inside the Capitol, Sully, the 2-year-old Labrador retriever assigned to Bush, sat by the casket in the company of people who came to commemorate Bush's signing of the Americans with Disabilities Act, the 1990 law that, among its many provisions, required businesses that prohibit pets to give access to service dogs. "After Mrs. Bush's death, general companionship was a big part of Sully's job," John Miller, president and CEO of America's VetDogs, said in a phone interview. "One of the things that I think was important to the president was the rest command, where Sully would rest his head on the president's lap." The law was just one point of intersection for Bush and Dole, now 95, who was one of its leading advocates in the Senate. They were fellow World War II veterans, Republican Party leaders, fierce rivals for the 1988 Republican presidential nomination won by Bush ("Stop lying about my record," Dole snapped at Bush) and skilled negotiators. Dole, an Army veteran hit by German machine gunfire in Italy, has gone through life with a disabled right arm. Bush, a Navy pilot, survived a bail-out from his stricken aircraft over the Pacific and an earlier crash landing. On Tuesday Dole was helped out of his wheelchair by an aide, slowly steadied himself and saluted Bush with his left hand, his chin quivering. Dignitaries had come forward on Monday, too, to honor the Texan whose service to his country extended three quarters of a century, from World War II through his final years as an advocate for volunteerism and relief for people displaced by natural disaster. Bush, 94, died Friday. With Bush's death, his legacy across the Middle East takes root in that 100-hour ground war that routed Iraqi forces. After services in Washington, Bush's remains will be returned to Houston to lie in repose at St. Martin's Episcopal Church before burial Thursday at his family plot on the presidential library grounds at Texas A&M University in College Station. His final resting place will be alongside Barbara Bush, his wife of 73 years who died in April, and Robin Bush, the daughter they lost to leukemia in 1953 at age 3. Bush's death reduces membership in the ex-presidents' club to four: Jimmy Carter, Bill Clinton, George W. Bush and Barack Obama.